Peanut Butter Cup Cookies are the perfect little treat. 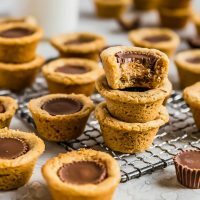 Mini peanut butter cups are baked right into tart shaped cookies for a delicious bite-sized dessert. Everyone will eat these Reese's Cup Cookies right up because no one can resist chocolate peanut butter cookies! 1/4 t. Coarse Sea Salt opt. Prepare the mini-cupcake tins by spraying with cooking spray. Cream butter and peanut butter until totally combined. Add both sugars and cream together for 3 minutes. Combine the flour, baking soda and salts. Mix just until the flour mixture is well incorporated, but do not over-mix. Roll into 1-inch balls and place one in each mini-muffin cup. Bake 8 1/2-10 minutes - just until they start turning a little darker brown. Remove from the oven and press one peanut butter cup into the middle of each muffin. Let cool and set for 2 minutes, then remove carefully (I use a thin table knife) and place on a cooling rack. These freeze well. The taste will stay the same, but the chocolate might have a little bit different look.